Our “primary highways” series continues with a visit to Louisiana. It combines my own visit to New Orleans with a “virtual visit” through other parts of the state. We start in New Orleans, which I visited in November of 2006, during the recovery from Hurricane Katrina. Coming in from the airport on I-10 we approached the downtown. The highway comes close to the Superdome and the downtown buildings. A large interchange connects to Business US 90, which heads over the Mississippi River via the Crescent City Connection. It was good introduction. I stayed in the Garden District along St. Charles Avenue. The streetcars which had traditionally run along the St. Charles were still out of service, so I made my way between my home base and Tulane University by walking and enjoying the warm weather. To get downtown, I either walked or used whatever form of transportation I could access. I of course visited the French Quarter, and sampled the food and drink. But it was also fun to wander the smaller streets, and find odd stores and corners. An occult store, where I found black-cat fur for good luck. An old book store with a resident cat as a host. And an artist selling these cat-themed jazz pictures (does one sense a theme here?). Being interested in art, I headed up Canal Street on a still function streetcar line to the city park and the New Orleans Museum of Art. The park had suffered extensive damage from which it was still recovering, but the museum had weathered the storm quite well and reopened after a few months. I spent most of my time in the city sculpture garden adjacent to the museum, which included several modernist works. On the trip back along Canal Street, I paid closer attention to the buildings along the road. Particularly south of the park but north of the I-10 overpass, there was quite a bit of damage visible, with boarded up houses and entire bulldozed lots. Indeed, throughout the trip is impossible not to see the scars of Katrina. Just east of the French Quarter was the Fauborg Marigny district. It was a bit funkier, and in retrospect and had that feel I enjoy in many neighborhoods of New York and San Francisco (think Lower East Side, the Mission, etc.). It was here that I sought out opportunities to hear local music. At The Spotted Cat I heard quite a few musicians both in traditional jazz idioms and other styles – this seemed to be music for a local crowd rather than for tourists, which is what I was looking for. And it had a cozy, dark, feel, with quirky lighting and artwork. I did set aside some time to see what had become of the Lower Ninth Ward. In a rented car, I headed east on Claiborne Avenue (LA Highway 39) and crossed over the canal into the district. I had of course followed the news and seen many images of the Lower Ninth Ward, but it’s another thing entirely to see it in person. And it’s not just one example, it kept going in all directions. And there were very few people around. It was eerily quiet, just me, the ruined buildings and the occasional car passing by. But the Ninth Ward’s history goes back far earlier than Hurricane Katrina, as it was the site were a certain Homer Plessey was removed from a train for sitting in a white car, leading to the infamous Supreme Court case Plessey v. Ferguson. After the Lower Ninth Ward, I headed back across the canal and north to the edge of Lake Ponchartrain. The lake is huge, one can’t really see across it, especially on an overcast day. The waves and wind made me think of the windy Pacific coast of California. Here, too, there were signs of what happened to the city, all the more ominous with the gathering storm clouds. It is hard to escape from the regions food while exploring its geography. And in truth, why would one want to. The eastern edge of New Orleans and Lake Ponchartrain is also home to NASA’ Michoud Assembly Facility, where many of the rocket and spacecraft engines have been built, including the first stage of the Apollo Saturn V rocket, and the external fuel tank of the Space Shuttle. Continuing on I-10 and US 90 east, we could head to Mississippi where we began our article on that state. But instead, we return to New Orleans and the banks of the Mississippi River. The river, too, is quite wide an impressive as it passes by the Crescent City – the nickname in fact comes from the bend in river as it passes by the city. We cross the river on the Crescent City Connection to the “west bank”, which is actually south here. We continue on US 90 Business and turn south onto LA 23 towards the town of Belle Chase. LA 23 crosses the Gulf Intercoastal Waterway via an old bridge and tunnel pair, and then hugs the west bank of the Mississippi to the mouth of the river. The geography of southeast Louisiana is strongly shaped by the interaction of the river and the Gulf of Mexco. This is certainly true of New Orleans and Lake Pontchartrain, but it is most dramatic where the river literally pushes into the gulf. The small fractal-like slivers of land are really just a boundary between the two overlapping bodies of water. LA 23 ends at the town of Venice, which is the last town accessible by standard automobile. The town really is just wedged on one of these fibrous tendrils of land up against the river. Of course, the remainder of the delta is accessible by boat, including the Delta National Wildlife Refuge and the Pass A Loutre State Wildlife Management Area. The natural environment of the delta, as well as towns such as Venice, have been hit twice in the last decade, first with Hurricane Katrina and then with the Deep Water Horizon oil spill in 2010. New Orleans continues to function as the hub for this particular virtual exploration. We next head west on I-10 and turn south onto I-310, which crosses the Mississippi on the cable-styled Hale Boggs Bridge. We then head north (back on the east bank of the Mississipp) via US 61 to the town of Laplace. I was disappointed to find out this was not named for the Laplace transform in mathematics and signal processing, but on the plus side it is known as the “andouille capital of the world”. And we would be remiss if we did not stop here to sample the famous and tasty sausage. We continue on I-10 past a junction I-12, which covers the northern side of Lake Pontchartrain, and arrive in the capital Baton Rouge. The Louisiana capitol building is quite distinctive. Rather than the typical Greek-inspired dome and columns, it is an Art Deco skyscraper. It in fact looks quite a bit like City Hall in Los Angeles. This capitol building was the “pride and joy” of Governor Huey Long. It is also where he ultimately met his demise in this hallway. We then cross the Mississippi again and turn south on Louisiana State Highway 1. At first, it follows the west bank of the river, but then heads southward, beginning a long parallel with LA 308 on opposite banks of Bayou Lafourche. We pass the town of Belle Rose, which I had written about in a post last year in an art-damage moment because it contained Highway 998 and fit well with a poem I had written called “998”. Continuing on LA 1 along the bayou, we come to the town of Thibodaux. As in New Orleans, the cemeteries are above ground here as well. South of Thibodaux, we turn west on US 90. The is a major highway and being upgraded to interstate standards, passing by the Bayou Teche National Wildlife Refuge as well as several towns. We turn south onto LA 329 to Avery Island. This actually is not an island at all, but it is a salt mound that rises in an oddly circular fashion from the flat landscape. It is most known for being the home of Tabasco hot sauce. We at CatSynth are of course fans of all things hot and spicy, and so visiting this factory and a tasting session would be in order. We continue on US 90, which passes the towns of New Iberia and St Martinsville, on the Bayou Teche. We then come to the city of Lafayette, where we cross I-10 and continue northward on I-49. The area along the highway was part of an ancient flow of the Mississippi that apparently was wider and further west than it is today. Heading northward, the wet environment of southern Louisiana gives way to a drier landscape. Via LA 1 we come to city of Natchitoches, which has the feel of an older historic town. We continue north on I-49 to its end at I-20 near Shreveport, the third-largest city in the state. The bypass highway I-220 spans nearby Cross Lake on a graceful modern bridge. The view from below with the arches is an interesting optical effect. These dogs in a kayak are also quite admiring of the I-220 bridge. And we end back along the Mississippi River with this video tribute. In this installment of our “primary highways” series, we look at the states of Mississippi and Alabama. In some ways, this is a particularly challenging edition, as I have never personally visited either of the states – in fact they are among only five remaining states I have yet to visit (Kansas, which held its causes on Saturday, is another of the five). So we will do the best we can. I did come close to visiting Mississippi in 2006. For one day while I was in New Orleans, I had rented a car to reach places outside the public transportation grid that was still limited after Hurricane Katrina, including the Lower Ninth Ward. I was tempted to get back on I-10 and head east to Mississippi, just to be able to say I was there. But in the end I decided against it. Had I continued, I would have crossed into Mississippi in a sparsely populated area along the Pearl River. To the north of I-10 is the John C Stennis Space Center, where NASA has tested engines for many of our legendary space vehicles including the Apollo Saturn V and the Space Shuttle. G iven that it is an engine test facility, it’s not surprising there isn’t much of a permanent population in the area. Several communities were removed when it was built, and supposedly a few remnants of the communities, particularly Gaineville, still exist. Indeed, off of Highway 607, the “Shuttle Parkway”, is Lower Gainesville Road, which heads past various space-center complexes towards the Pearl River and ends at what could be the remains of the town. Heading southward on 607 from I-10, we eventually reach US 90, which continues along the Mississippi coast through the towns of Waveland and Bay St Louis, which were devastated by Hurricane Katrina. Perhaps the most dramatic example was the bridge carrying US 90 over St. Louis Bay, which was completely destroyed. It has since been replaced by a new bridge, a graceful flowing structure that has won the American Transportation Award and became a symbol for the region. US 90 continues along the coast as Beach Boulevard towards the cities of Gulfport and Biloxi. Biloxi is a big resort and casino town on the coast, but it, too, was devastated by Hurricane Katrina. Although it sounds like there is still much rebuilding to be done, many of the city’s casinos have since reopened and landmarks restored including the iconic Biloxi Lighthouse and the Ohr-O’Keefe Museum Of Art that was designed by Frank Gehry. The Ohr-O’Keefe was under construction when Katrina hit and was severely damaged. It ultimately opened in 2010. South of nearby Gulfport is Cat Island. I thought maybe it had something in common with the famous Cat Island off the coast of Japan, but no such luck. As far as I can tell, there are no cats there, and the name itself was a mistake. From the southeast corner of the state, we jump to the northwest corner. Specifically, we are going to a junction outside of Clarksdale where US 61 and US 49 meet. This crossroads is considered by many “the crossroads”, where according to legend blues musician Robert Johnson sold his soul to the Devil in exchange for his musical gifts. Legend or not, Clarksdale has a particular association with the blues, and is home to the Delta Blues Museum. US 49 has long been a major highway traversing the state diagonally. From Clarksdale, it winds its way through the Mississippi Delta, even splitting into separate east and west parts, before leaving the delta and approaching the capital and largest city, Jackson. On the northwest approach to the capital, US 49 carries the name Medgar Evers Boulevard in honor of the civil rights leader who was assassinated in Jackson in 1963. The highway then bypasses the downtown with I-220 and I-20 before continuing to Hattiesburg, home of Southern Mississippi University. In Hattiesburg we meet I-59. The drive along I-59 and US 11 to the town of Laurel was recommended to me (actually, the drive south from Laurel to Mississippi State University). In Laurel, I-59 had an unusual S-curve that rivaled Dead Man’s curve in Cleveland due to railroad overpasses, but it has supposedly been reconstructed. I-59 continues north to Meridian, where it joins with I-20. Briefly leaving the freeway in Meridian, one can take Highway 19 north to the town of Philadelphia, made infamous for the death of three civil rights workers James Chaney, Andrew Goodman and Michael Schwerner. The murders took place off of Highway 19, and it was presumably the route they took to Neshoba County. I-59 and I-20 continue as a single route into Alabama, all the way to Birmingham. It is largest city in either of the states in this article, and is crisscrossed by several major highways. A large interchange between I-59/I-20 and I-65 just west of downtown is known as Malfunction Junction because of the frequent (and unfortunately, sometimes deadly) accidents that happen there. 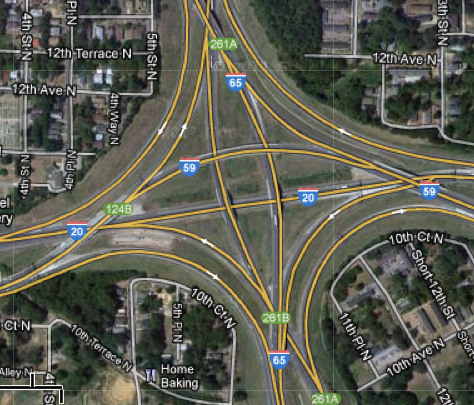 Interestingly, it does not look that complex from a map view, especially when compared to a nearby junction of I-59/I-20 and US 31/US 280. While it does look more complex, it does afford a good view of the city skyline when approaching from the south. Birmingham has a strong industrial past, especially in iron and steel. Indeed, the Sloss Furnace in the city is one of the few industrial sites preserved as a National Historic Landmark. South of Birmingham is the town of Selma, which has a storied place in the Civil Rights Movement. A voting rights movement in the town ultimately grew into the Selma to Montgomery Marches in 1965. 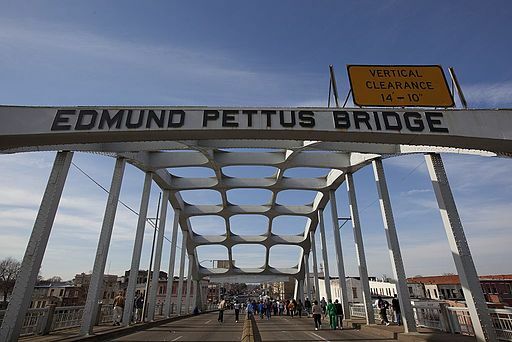 The marches took place on US Highway 80 heading east from Selma and crossing the Edmund Pettus Bridge. The first march was met by state troopers and the marchers were brutally assaulted. Images “Bloody Sunday” were broadcast nationwide, shocking many and galvanizing support among some for the civil rights movement. Two more marches along the same route were organized. The third march passed the bridge and continued all the way east on Highway 80 to Montgomery. The march then veered north onto the Mobile Highway, parallel to present day I-65, and then along city streets to the state capitol. 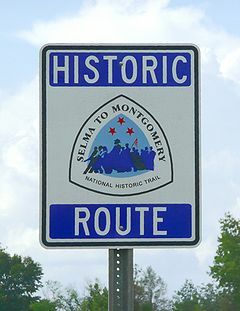 The entire route is now marked as the Selma to Montgomery National Historic Route. 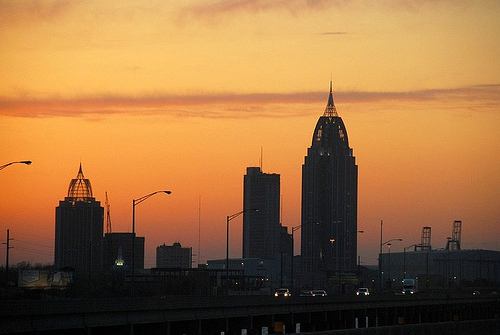 From the state capital, one can travel south on I-65 to Mobile and back to the Gulf Coast, where we began. We switch on to I-165 which enters the downtown and becomes Water Street. Heading further south, we come back to I-10, which crosses Mobile Bay on a long causeway. From the causeway, we can look back at the city at sunset. This is the interchange of I-85, I-75 and I-20 in Atlanta, GA. No personal significance, though I do like how the incredibly complex curved shapes are bounded by the very rectangular city streets. Of course, the combination of curved forms and rectangular geometry is not too uncommon here at CatSynth.